The Free Library of Philadelphia is thrilled to partner with Philadelphia's beloved film screening series, The Secret Cinema, now in its 27th year. As usual, The Secret Cinema will present selections from their collection shown on 16mm film onto a big screen. This time the focus will be on subjects related to those illustrated in the Philadelphia - The Changing City exhibit on view now until April 13th in the Rare Book Department's 3rd floor Dietrich Gallery. 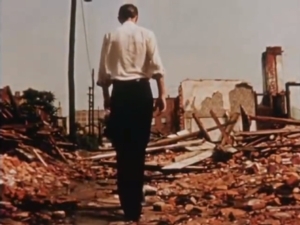 OUR CHANGING CITY (1955) - Made by the city during the administration of Mayor Joseph Clark, this vivid color film makes the case for urban renewal (i.e., demolition and new construction) while showing a wide range of cityscapes -- from new homes in the Northeast to the poverty of people living in houses without plumbing or electricity. NOT IN MY BLOCK (1964, Dir: Robert Disraeli) - An exploration of housing segregation in Philadelphia, with views of residents, real estate brokers and appraisers, bankers and builders. Narrated by famed ABC-TV reporter (and later anchorman) Howard K. Smith, the film was co-produced by the City of Philadelphia's Commission on Human Relations and the American Jewish Committee Institute of Human Relations. LEWIS MUMFORD ON THE CITY: THE CITY AND THE FUTURE (1963, Ian MacNeill) - This film, (which does NOT focus on Philadelphia), was the final chapter of a series hosted by the eminent American historian, sociologist, philosopher of technology, and literary critic Lewis Mumford. In this episode, Mumford considers the "loss of vitality" that he perceives in contemporary cities that have become crowded and resulted in suburban flight. The National Film Board of Canada spent five years producing thisambitious series, filming in eleven countries. Before the movie, stop by the 3rd floor to see the Philadelphia – The Changing City exhibit in the Rare Book Department which will be open an extra hour this evening until 6:00pm.